The official Super Smash Bros. site has shown some information regarding the character creation with Miis and the character customization with all of the characters available. Each character except for custom made Miis and Palutena will have the ability to customize their special moves to their preferences for offline use against friends. However fear not Mii users and Palutena fans as both of these characters will have their own set of completely unique attacks. 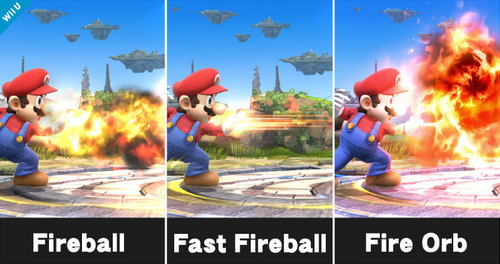 For example Mario can be customized to change his classic fireball into a fast fireball or even a giant fire orb. On top of being able to customize your character's moves you'll be able to customize them with a combination of three equippable items. These equippable items don't change your character's looks but change their various stats and defenses. For example you might equip your character with "Easy Split-Second Shield Overalls" which will increase your character's defense by 66, decrease your character's movement speed and give them a unique ability of having an easier perfect shield. You'll be able to collect these items in the various game modes found on Super Smash Bros. however many of them while having the same name, may have varying stat changes. When creating your personalized Mii you'll be able to select from three fighting styles; Swordfighters, Brawlers and Gunners. Each fighting style will have 12 unique special attacks that you can select from to further personalize your Mii. Last but not least you'll have the ability to customize your Mii's clothing for that last bit of personalizing. Miis will not be usable when playing online however it has been announced that they plan on allowing it for online use with friends. What are your thoughts on the character customization options for Super Smash Bros.? Are you looking forward to being able to customize your character or are you just excited to start bashing faces with some of your favorite characters?